What are the characteristics of front entries during this period? Typically entry doors are rail-and-style wood construction with raised panels. Commonly they’re designed with two panels with the upper panel made of glass and decorative motifs. Four or six panel doors will combine flat and glass panels. Generally speaking these homes have a porch or a projecting pavilion above the entry door. 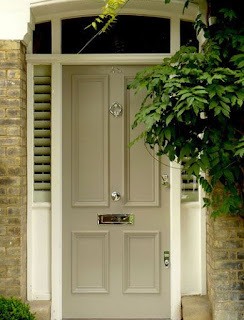 Either material will be suitable to create the Victorian style entry door look, however wood is preferable. 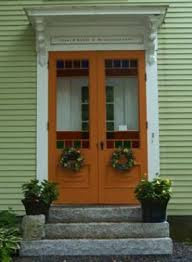 In most cases, the entry door is protected by a porch, which eliminates weather exposure concerns. Second, wood can finished to mimic the same carved moldings throughout the rest of a Victorian house. Expensive Fiberglass is an alternative that will give the look of wood, but it’s unlikely you can match the overall finishes to the home. A very real challenge that most homeowners face when selecting an entry door is translating their favorite style photos into an actual door that will give their home the look. 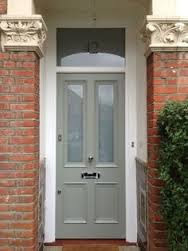 Selecting just the right door for a Victorian style home presents this challenge in spades because Victorian is a stylistic hodgepodge of classical decorative elements – it’s expression is very individual. Bring photos into Woodland’s showroom and we’ll show you the door profile and glass options you can build from. 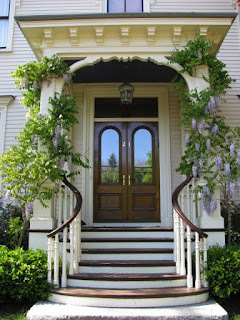 For example, a classic London Victorian will have twin glass panels in the four-panel door. Jeld-Wen Custom Wood Glass Panel Collection or Simpson Door Selects Series offer the door profile to create this look. Or if you’re looking for a single large glass opening the Therma-Tru Fiberglass Classic Craft Canvas Collection is a good place to start. Use your imagination and design away. Today the availability of glass options is as endless as the glass expressions you’ll see on Victorian style doors and windows. Large single panes of clear or etched glass, standalone or framed by square panes are universally liked. Frequently you’ll see multi-paned clear glass or colored glass insets. More elaborate use of glass includes stained glass or beveled glass designs in a variety of motifs’. Check out Simpson Door for glass panel ideas. You’ll have no trouble finding an assortment of suitable hardware choices for your Victorian entry door. We suggest you make your entry door hardware traditionally conforming, yet unique. You can do this by observing the door hardware of yesteryear such as, an oversized knob centered on the door or an address etched in the glass above the door. The Victorian era was the romantic period – express yourself.